A zoo is an unnatural habitat. A zoo’s primary focus is not on its constituents, but on providing value to its paying customers. Human resources power the Knowledge industry. Yet, service organizations often focus less on their employees, and more on shortcuts to appease their demanding customers. For instance, Design Architects are frequently used for coding tasks, Technical Leads for people management roles, Automation Engineers for manual testing, specialized COE resources for generic programming, and so on. In the long run, such organizations turn into ‘zoos’ with a continuous dilution of employee core strengths. Sure, it is difficult to always guarantee a perfect mapping of skills with tasks. But if the intent is right, a mature organization will exercise self-discipline over short-term greed. The end result is a ‘civilized’ institution that delivers consistent value to all its stakeholders. Yes, perfect match do have gap, it is less and reduces with time to make it perfect!. I think employees should also work on this not only higher salary. However, it’s a slightly flawed one. Camels are by consequence of countless years of evolution adapted to survive and thrive in a desert-like environment. This is part of a camel’s “nature” rather than “nurture”. Knowledge workers, especially in the service sector, are driven by meeting their clients’ goals and requirements. One can argue for better allocation of workers to the work available, however, this in computer science is a hard problem (known as the ‘Knapsack Problem’) which has no optimal solution. One can accept a suboptimal solution based on the combinatorics of the knapsack problem, but that would invariably be a low-risk low-reward path. There is no one correct solution here, however one approach is to optimize your resources so as to enhance the flexibility of your resource allocation, this could imply investing meticulously in retraining your workforce, and more broadly fostering a culture of learning. Thus, this is part of a knowledge worker’s “nurture” rather than “nature”. The workers being animals in a zoo for clients who are spectators doesn’t bode well as an analogy as the animals are only being observed rather than providing any form of economic output for their spectators. A better analogy here is that of the zoo worker, who probably completed a degree in BBA, found it hard to obtain a job in his/her field of interest, and thus had to take up a job at a zoo to make their ends meet, and indirectly for the economy as an aggregate. It is really great to read that you did think in this direction. I respect that you are a true leader. Leaders of today groom the ones for tomorrow. It’s true but managers with good intention do pass people management task (a small report, a small presentation will do no harm) often with a sense if they are going to groom next leader and small task delegation helps them focus better on their own job. It is such a fine line difference between delegation and pursuing interest that one as a leader have passed and many people will be benefited out of it. Once in a meet the CEO meet years back you had a wonderful line that defined my career – Managers have short term memory. Be clear and be consistent in efforts. Questions that must be raised and asked is that do I know if as a manager my reportee is interested in management route of growth or technical route of growth? If interested in technical route, grooming should happen that way. Leaders are not only CEO but even a manager or system analyst who has to groom some or the other Junior. I wish cybage great success and hope every leader in Cybage applauds and learns from this valuable post. 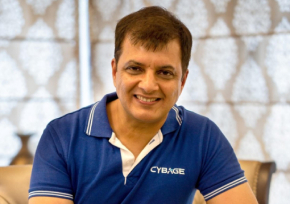 Hi Arun, I am happy and proud to have you as my X-CEO… 🙂 Your thinking in this direction is taking Cybage to newer heights. This is a great place where you will find happy employees. All the best to this journey.